A few days ago we said goodbye to Sedona, one of our favorite old bobcats. We’re guessing she was around 19 years old. She was an adult bobcat when she came to Southwest Wildlife, badly injured from a run-in with a porcupine. Despite living at the sanctuary for more than 10 years, Sedona remained a shy and wild cat, at least to humans. She preferred the company of other bobcats. 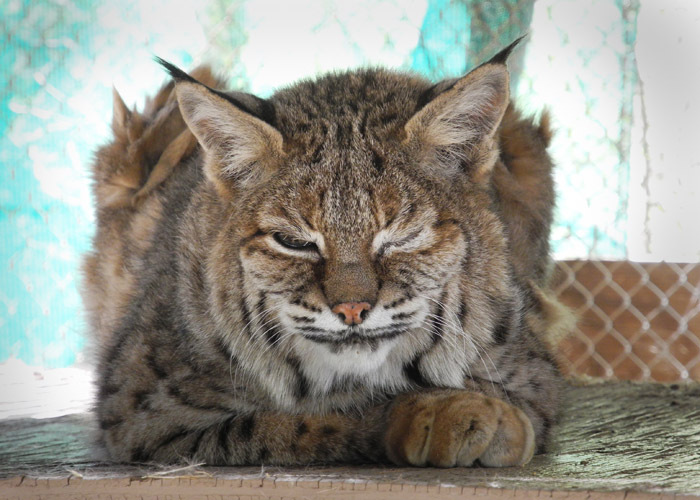 Here is a story a volunteer wrote about Sedona and one of her elderly bobcat friends. The cat arrived dehydrated and starving this past summer. She was found beside a road up on the Hopi Indian Reservation. The vets estimated her age at nine years – old for a wild bobcat. This cat spent a long and mostly solitary life going wherever she pleased, never asking permission, defending territory and raising young. Now she could no longer care for herself. Imagine her confusion at her current situation. During the months of rehabilitation she expressed her displeasure loudly. Any attempts to approach her were met with menacing growls, often followed by a lunge which would rock the entire crate. When the old bobcat was ready to leave the clinic Linda Searles, our Director, chose Sedona, a shy, older female bobcat to be the Hopi cat’s roommate. Southwest has been Sedona’s home for many years. She was captured in a chicken house with a face full of porcupine quills, no teeth and a badly infected left eye, which was removed. Sedona, however, is a caregiver who excelled at mothering orphaned bobcat kittens and reassuring injured bobcats recovering before release. She was showing her age now, her one eye a little cloudy. So, while Linda excels at the art of wild animal matchmaking, I still worried about quiet Sedona. A few weeks after their introduction, I stood outside Sedona’s pen and listened to the old Hopi cat. Her screams would rise to a crescendo and then fall into a low growl which rumbled in her throat before rising again into another piercing scream. The old cat was still agitated, unhappy and, like Sedona, she would hide beneath the bobcat house whenever I entered to clean. I was surprised then, a couple of Mondays later, to hear a soft, throaty melody coming from Sedona’s area. Glancing over, I saw both cats on top of the house. Sedona, eyes closed, looked like she was in heaven as, beside her, the old Hopi cat licked her face, all the while singing softly. When the cats noticed me watching, Sedona moved to jump down and hide, but the old cat spoke quietly to her. Sedona crouched, twitching nervously. The Hopi cat licked Sedona’s paws and spoke to her saying, quite plainly “I’m here. I’ll take care of you. Don’t go.” Sedona remained on top of the house, behind the old Hopi cat, watching me with her one eye as I cleaned. The old cat would occasionally mumble something to me about being careful. I was. I finished up and left – smiling. After all her years of giving, Sedona would now receive. 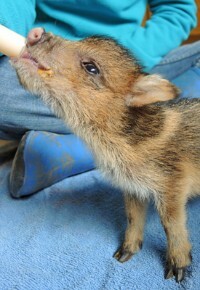 The old Hopi cat would give her the gift of being cared for. She’s earned it.